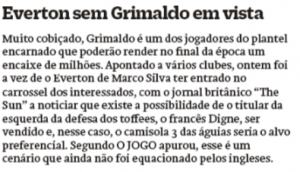 Given the English media reported Everton’s chase for Benfica left-back Alex Grimaldo this weekend, most Portuguese outlets are covering it today. 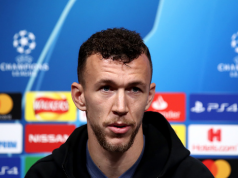 Many newspapers now repeat the claims which said the Toffees would plan to offer £20m for the Eagles player in case Lucas Digne leaves them in the summer. However, as O Jogo covers these claims today, they say they’ve learned that this is a scenario which hasn’t even been ‘equated’ by the English side. That’s literally all they say for now, with only one sentence at the end of the short story saying the Toffees aren’t even thinking of this transfer at the moment. Alex Grimaldo has been linked to several European giants in the past couple of seasons, and from reading the Portuguese stories, the thing we found strange is that none of them question if £20m would be enough to sign the player from Benfica. The Spaniard is protected by a €60m release clause, and that amount has always been pointed out as a reference in case a club open negotiations for him.